College financial aid award letters give families a sense of what college costs after factoring grants, scholarships, tuition discounts and tax benefits. What is less clear is the broader picture of how much money different types of students receive from a variety of financing sources. 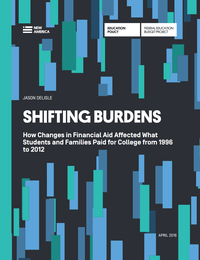 In the new report, “Shifting Burdens: How Changes in Financial Aid Affected What Students and Families Paid for College from 1996 to 2012,” we take a comprehensive look at what students paid for school and what trends have emerged, using data from the National Postsecondary Student Aid Study. The report’s author Jason Delisle, Director of the Federal Education Budget Project examined financial trends by family income, a student’s dependency status, and school type using information about college financing at the student level. This bottom-up analysis of student-and-family-level data shows how the colleges that students chose to attend affects financing trends. His analysis also looks at the share of college costs each financing source covers, revealing which sources are growing faster than others or whether costs are growing at the same pace as financial aid. The report shows how the share of college costs that the federal government financed rose significantly and consistently from 1996 to 2012 for nearly all income groups and school types. “The analysis puts into sharp relief how the role of federal aid, the role of state funding, and the role of student debt have changed markedly since 1996 in how we finance college in this country. And seeing those changes by family income and school types uncovers some surprising findings,” said Delisle. Changes in college prices vary dramatically by sector, family income, and dependency status. In particular, students at community colleges and independent students at public four-year colleges have not seen an increase in prices over the time period analyzed. Reductions in state funding were larger for students from wealthy families than for their low-income peers. For low-income families and independent students, increases in federal aid nearly or completely offset declines in state and local general subsidies. This trend was most pronounced at community colleges and for independent students at public four-year colleges. Aid provided directly to students at public four-year colleges played a much larger in college financing in 2012 than in 1996. But that has not necessarily lowered prices. Rather it reflects a shift in how college is financed and subsidized. Students from families in the $30,001–$65,000 income group at public four-year colleges saw the largest increases in direct aid from all sources (state, federal, and school). Across the board, students and their parents borrowed more to pay for college costs between 1996 to 2012, paying a smaller share of out-of-pocket costs. Even in cases where students have not seen higher prices, such as community colleges, they still increased their use of debt relative to out-of-pocket spending. That suggests a different type of family is financing college now, or students and families are more inclined to borrow than in the past even when prices have not increased. Families increased their use of the federal Parent PLUS loan program significantly between 2008 and 2012 at both public and private four-year colleges. Across almost all income groups of dependent students, parent borrowing increased more than student borrowing between those years.